It’s, like, totally the perfect invention for non-bakers like me. YES, I’m completely aware that I could make my own using ingredients already found in my own house, but the BOXED STUFF IS SO MUCH BETTER. You’ve had these before, right? They’re sausage. They’re biscuit. They’re cheesy. Also, they take c. zero intelligence to make, come out perfectly every time, and are a huge crowd pleaser. So, we shall make them. The last two ingredients are my additions, so you could leave them out. However, the dark umami flavor that Worcestershire sauce adds plus the heat of the cayenne….it makes the “baking mix” (ha) taste a leeeetle bit more upscale. If you were looking for your baking mix to taste upscale. These are so stinking easy. You’ll need baking sheets sprayed with cooking spray, so get that out of the way before you hands get all raw meat-like. Preheat the oven to 375F, and dump all the ingredients in a bowl. 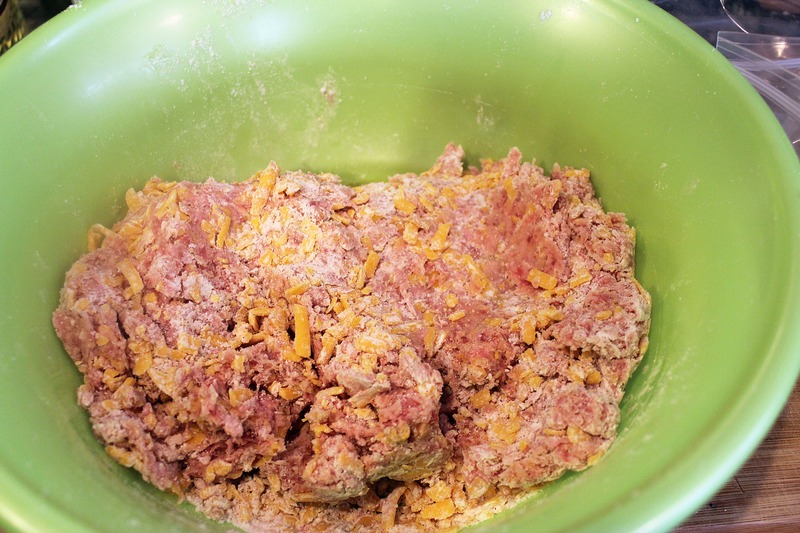 Use your hands to mix the dough together – it’ll be very crumbly! 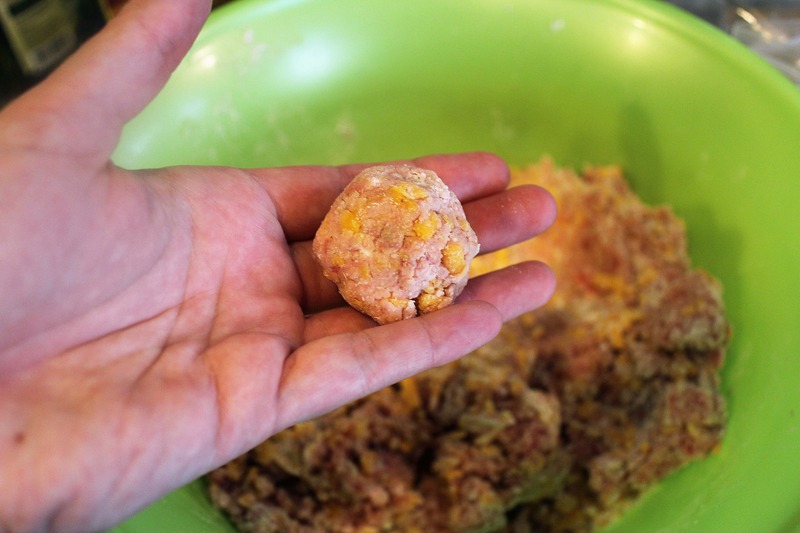 Make small balls (heh) by pressing the dough together – you’ll have to mash it, but that’s OK. 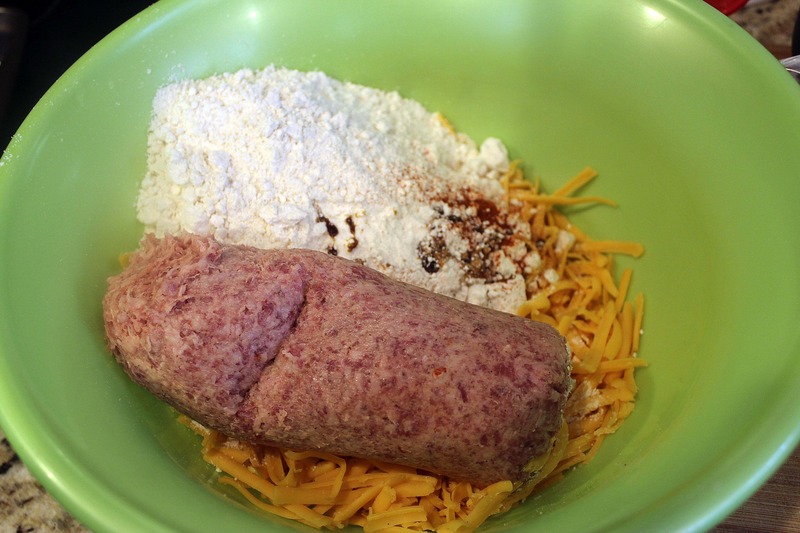 The moisture from the sausage and the cheese will adhere to the baking mix – I promise! 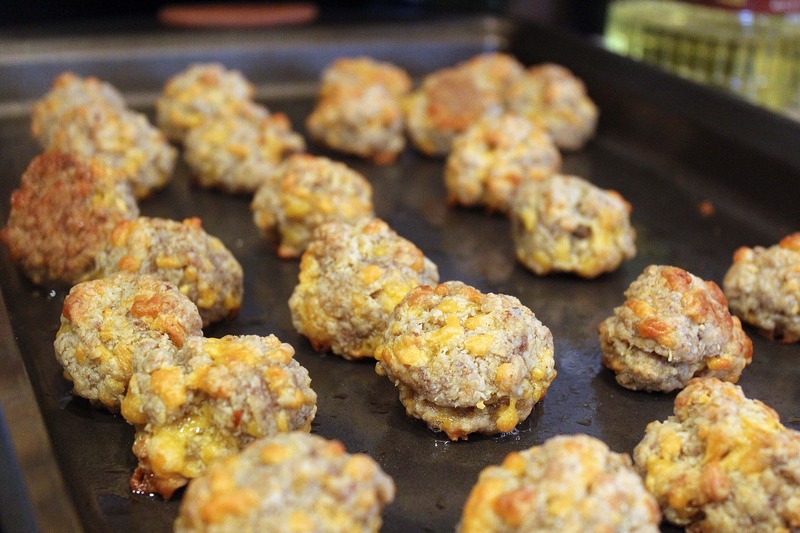 Make the balls smaller than 1 inch in diameter – they’ll look small, but they’ll puff up lots in the oven like a….wait for it….biscuit. Duh. 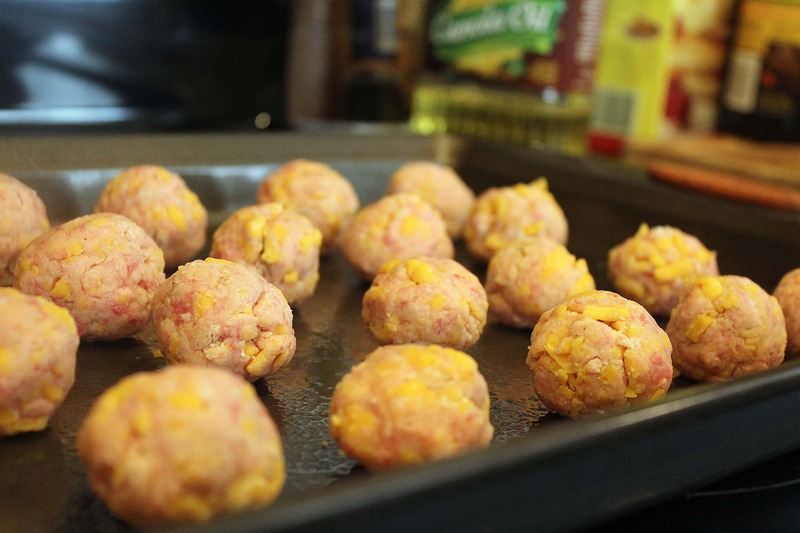 Bake the sausage balls for 20 minutes, until they are puffy and golden. Paula suggests shaking them once during the cooking process to avoid having 1 flat edge, but I didn’t do that and my life is still going really well. Sorry. Look how lovely! One batch will make 60 balls if you make them tiny, so you’ll have plenty – they’ll get gobbled up too, so don’t be afraid of the quantity. 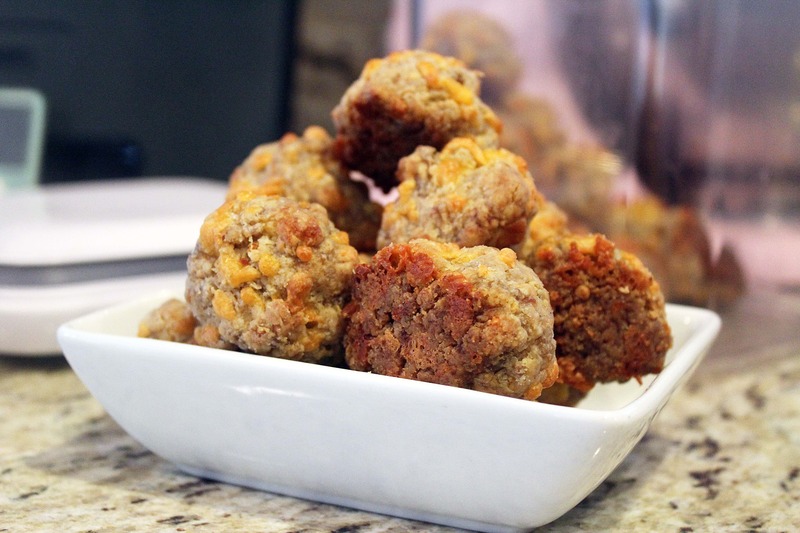 These are perfect for football days, Thanksgiving appetizers, or a snack when you need some carbs and fat in your life..and when is that NOT a thing? Enjoy these, guys. They’re delicious! 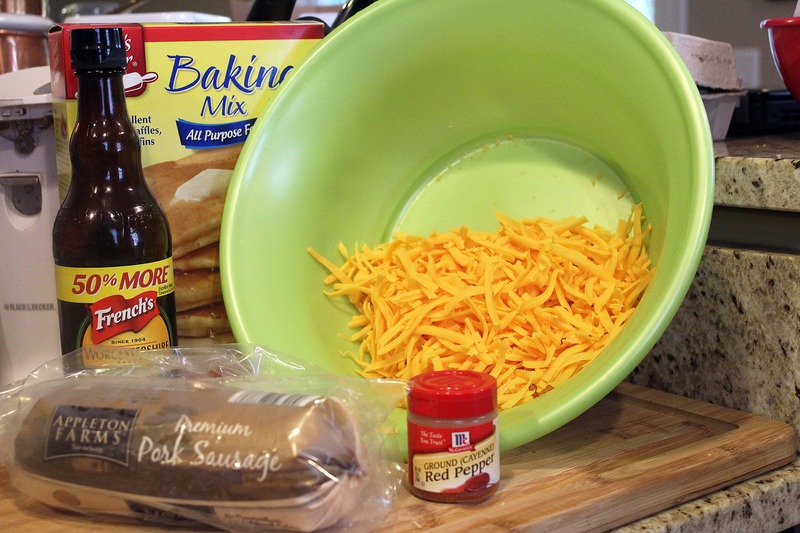 This is another Weekend Potluck submission – that fun thing that The Better Baker hosts along with Kim&Julie, Holly, Brandie, and Tabitha each Friday. Have a great weekend! 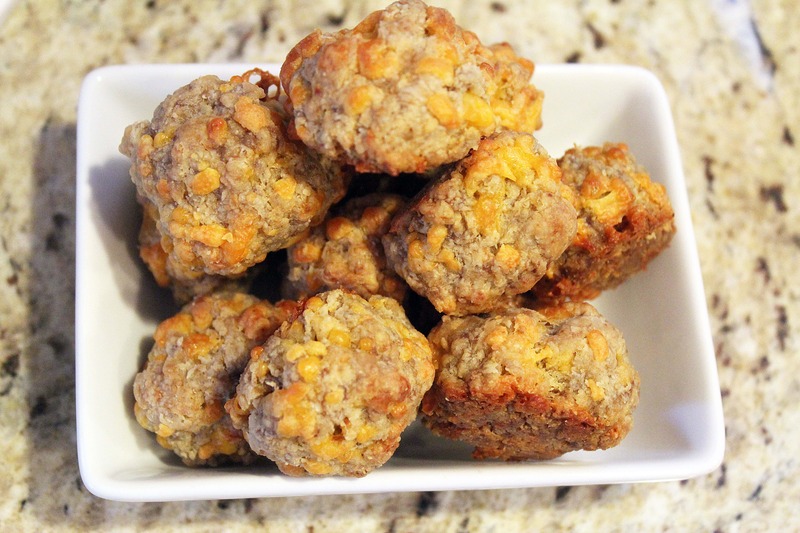 I made these last Thanksgiving using gluten-free Bisquick and they were a huge hit! Great to know! I’ve never tried the GF version – that’s so nice for people who need to avoid gluten to still be able to enjoy these!